Male: Bull - 650 to 800 kg. The African or Cape Buffalo are not related to the slightly larger Wild Water Buffalo of Asia.The Cape Buffalo is the largest of the sub specie found in South and East Africa. The African buffalo made its way into the Big 5 ranking because of their size, moody behavior and their ability to charge with no warning, the African buffalo has been said to be one of the most dangerous animals to hunt on foot. It can be easy to see why as these enormous bovid weighs in at 800 kg for a male and 750 kg for a female. The living African buffalo has evolved from a much smaller ancestor that entered Africa roughly 5-6 million years ago, the status of the buffalo has seen much decline over the years as the battle for land and livestock (cattle) continue. Buffalo are very easily recognizable on a game drive as they are a large ox like looking animal with very large bossed horns. Buffalo are dimorphic which means there is little difference between the male and the female. Male buffalo are often covered in mud and their bosses met in the middle of their head to form a helmet like structure on the head. Younger bulls often still have hairs on their horns. Female buffalo are more of a red brown in coloration and have more narrow horns. Female buffalo have a gestation period of 11 months and mating takes place during the late summer. Buffalo will try to have their calves in the rainy season when there is plenty of green grass, rich in nutrients, to support lactating cows. Cows normally give birth every two years. A calve can stand within in ten minutes of being born – a typical trait because buffalo are always on the move for food and water. Buffalo have a lifespan of roughly 23 years; they are ranked in their herds by their fighting capabilities. Buffalo will often have head on clashed to determine rank in the herd. The hide on the buffalo’s neck can be as thick as inches to protect it during battles with other male bulls for dominance. Dominant individuals will feed ahead of the rest of the herd or in the middle and gets the best nutrient rich grass and best access to females in oestrus. Buffalo are subsequently led by “pathfinders” (not necessarily dominant animals). Pathfinders act as a leader to the herd and determine where the herd will move. As buffalo get older and their reproduction peaks pass males will often be chased from the larger herds and are often found in small groups or on their own. These animals then get the nickname Dagha boys. Dagha is the Zulu name for mud and refers to the buffalo spending a lot of their past time in mud wallows. Buffalo are gregarious and live in mixed herds often numbering hundreds of individuals. They are not territorial because they are bulk grazers and need to find suitable grazing and water on an ongoing basis. Buffalo consume very coarse material and therefore require as much as twice a day. A buffalo can consume 35 liters of water at a time in a matter of minutes. Buffalo have excellent sense of smell and can use this sense to find food or detect danger and predators nearby. These incredible animals can also swim, and will cross rivers into areas better suited for grazing. When a buffalo feels threatened they can alert the entire herd – the calves and cows are sheltered in the center whilst the stronger males put on a united front, this is very intimidating for predators and often work in the buffalos favor. The buffalo will mob or intimidate predators and if necessary stampede. Buffalo try to always stay in the herd and have been very successful in defending the herd like this, even if faced with a pride of lion. Lion will often prey on the weaker, older individuals, the Dagha boys, as they are often solitary and weaker from age. BTB was first detected in buffalo in the 1990’s and was thought to have entered into the National game reserves through cattle- buffalo interaction. BTB is spread from buffalo to other animals including feline (Lion / Leopard) and needs to be managed carefully as it is highly contagious. Currently there is no cure for BTB and individuals have to be euthanized. The Cape buffalo was nearly wiped to extinction when the rinderpest virus struck South Africa in the 1890 s.
The virus was introduced into Africa by Italian cattle bought in by Italian soldiers for their fight against Somalia. It killed nearly 5.2 million cattle south of the Zambezi River. The epidemic was so bad that it wiped out a third of the Ethiopian population and two thirds of the Maasai people in Tanzania. Rinderpest was thankfully eradicated in Africa and subsequently South Africa, and the Cape buffalo can readily be seen throughout the game reserves. In Kwazulu Natal where Heritage tours are situated the Cape buffalo can be seen in Hluhluwe Imfolozi as well as in the Isimangaliso wetlands park where the buffalo are disease free. Come and join us on any one the safaris to enjoy magnificent sightings of these angry serious looking animals. The African buffalo as we know it today has evolved from a smaller ancestor that came into African 6 million years ago. The buffalo as we see today replaced a much wider horned type of animal that was abundant and very widespread. This has been replaced by what we know as domesticated cattle today. Many animals including the buffalo are being put under pressure as the need for land and livestock grow. Buffalo's occur naturally in Kruger National Park and surrounding private game reserves, Addo National Park and Hluhluwe Imfolozi game reserve. They are also found in various provincial reserves and also on private game reserves and game farms where they were reintroduced. Buffalo's are carriers of foot and mouth disease and they also suffer from bovine tuberculosis. Therefore they are not allowed beyond certain areas (red line areas) as they might infect other animals, more particularly cattle. 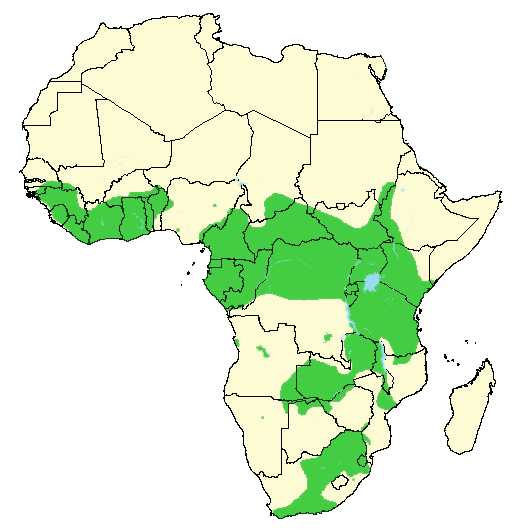 All buffalos that are reintroduced outside of these areas are bred elsewhere and are so-called disease free buffalos. They are large in size, thick bossed horns and tasseled looking ears. Their coats are thick and they range from reddish brown to black in colour, their faces, undersides and legs are often a paler shade. They have very serious looking faces and have been said to have a face “that you owe” money to. Buffalo prefer vast open Savannah grassland where there is long grass to graze on, they are often in reeds or in river beds and are reliant on a good source of fresh water. They consume water on a daily basis and a favorite pastime is to wallow in water and mud holes. Buffalo are often seen thickly covered in layer of mud. Buffalo are often found in either medium to large herds or bachelor males that have reached the end of their sexual maturity and who are no longer able to compete for female on their own. Bachelor males are referred to as dagga boys or loosely translated into mud boys, they are bachelor outcast who no longer live in the security of a herd and have been shown to show more aggressive signs. Wounded individuals will seek refuse in the safety of the herd, the herd is very group orientated and will look after blind and disabled members of the group. Buffalo eat predominantly grass species and because of the large groups and size they need a grass that quickly regenerates itself. They will even eat swamp or marshy materials. Buffalo are gregarious and will change their eating habits to their surrounding circumstances. Heritage Tours & Safaris operates a wide variety of day and overnight safaris. Situated in the heart of St Lucia, KwaZulu Natal. Join us and discover the true beauty of the African Bush.